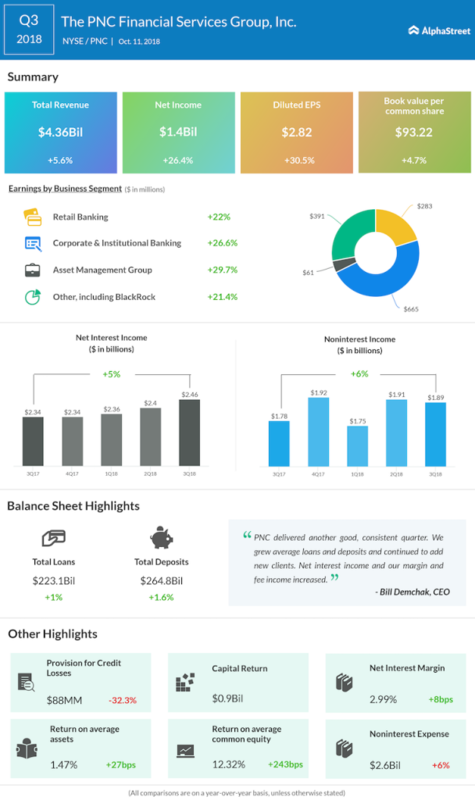 The PNC Financial Services Group Inc. (PNC) topped market estimates on revenues and earnings for the third quarter of 2018. Despite the beat, the stock was down 1% in premarket trade, hurt by higher expenses. The financial services firm reported total revenues of $4.3 billion, up 6% compared to the same period last year. Net income attributable to diluted common shares was $1.31 billion or $2.82 per diluted share compared to $1 billion or $2.16 per diluted share in the same period last year. Net interest income grew 5% while non-interest income grew 6% during the quarter compared to the prior year period. Higher loan and securities yields and balances were partially offset by higher deposit and borrowing costs, reflecting interest rate hike impacts. Net interest margin increased to 2.99% from 2.91% last year. Asset management revenue grew $65 million, reflecting benefits from the lower federal statutory income tax rate on BlackRock earnings and higher equity markets. Non-interest expense rose 6% from the same period last year due to ongoing business investments as well as higher variable compensation related to revenue growth, increased staffing, higher retail banking compensation and higher marketing expense. Average total assets were $377.9 billion in the third quarter. Average loans grew 2% to $223.3 billion while average deposits grew 1% to $262.5 billion. Total loans grew 1% and total deposits grew 2% from the prior-year period. Non-performing loans and assets declined by 10% and 12% respectively. PNC posted earnings increases across all its business segments during the quarter. The company returned $0.9 billion of capital to shareholders in the third quarter through repurchases of $0.5 billion and dividends of $0.4 billion. On October 4, the board declared a quarterly cash dividend of $0.95 per common share, payable on November 5, 2018. PNC’s stock is down 8.7% so far this year and over the past one month, it has dropped 8.1%.